Sometimes you come across a recipe that involves every ingredient in the kitchen and has seventeen steps and you know it will be fantastic because in the end you’ll have created something rich and decadent with layers upon layers of flavor – for example Coq au Vin requires marinating and straining and browning and braising and straining the sauce again, just about every dish in the cupboard and the end result is like liquid sin. And sometimes you come across a recipe that involves approximately four ingredients and one pan and you know it’ll be amazing because it’s so simple that it allows the flavors of each individual ingredient to shine through. Both variations on amazing food are acceptable and have their own appeal, but the simple, four ingredient one is definitely easier to make. 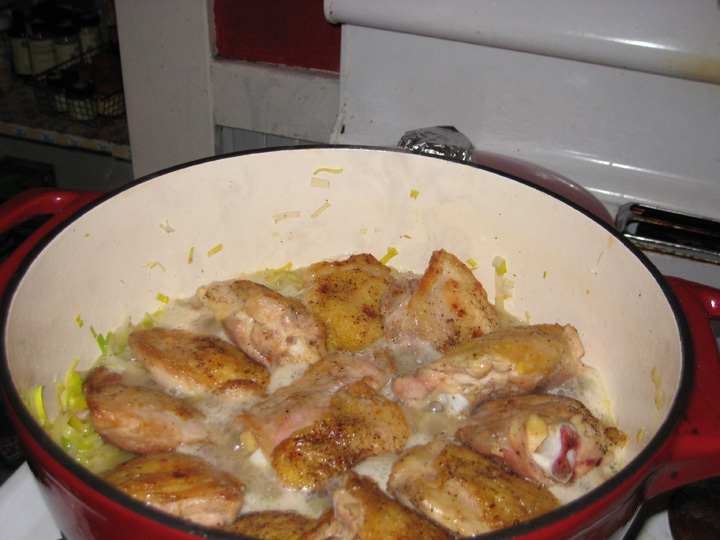 This recipe for Chicken in Riesling is advertised on epicurious as being like Coq au Vin, but made with white wine. In so far as they both involve braising chicken in wine this is true, beyond that they bear no resemblance to each other that I can discern. Well, except they are both very tasty. The Chicken in Riesling has the added benefit that it let me pretend that it was actually Spring this week despite the fact that the first half of this week was cold and wet and miserable – we escaped being deluged with snow this winter, but apparently we’re making up for it all now in the form of rain and more rain and then for some variety yet more rain. The mounds of pale green leeks looked like Spring, but they cooked down with the white wine and crème fraiche to a rich sauce that coated fall apart tender chicken thighs. It was nice compromise between the promise of Spring and the reality of late winter in Massachusetts. You’ll note that the recipe calls for carrots in the stew and if you’ve been paying attention you’ll know how much I loathe mushy carrots in soups and stews. I haven’t changed my mind about this. 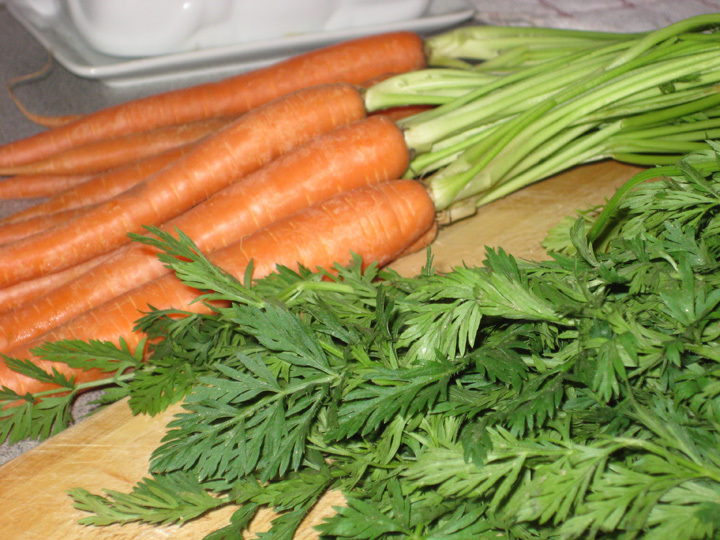 I still think that carrots are the scourge of beef stew. However, these carrots came with frondy greens still attached and I’ll buy a lot of things I don’t really like if they’re pretty to look at – this is a definite problem when it comes to the baby eggplants on display at the farmer’s market all summer. Plus, there aren’t that many carrots in the stew and they’re so smothered in sauce when you eat them that you don’t really taste them. Plus, the way I cooked them they weren’t actually overcooked so that helped too. And finally, the dish needs the splash of color that they provide – I actually think you could add more than the recipe calls for – and I’m usually willing to suffer a little for the sake of an aesthetic goal. After all it’s not like I wear 3” heels because I think they’re that comfortable. Preheat oven to 350F with rack in middle (I didn’t turn my oven on until after I’d finished browning the chicken). 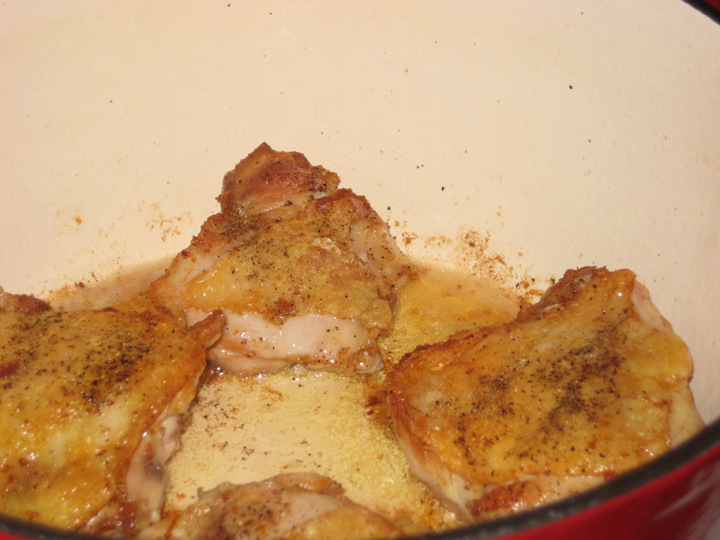 Pat chicken dry and sprinkle with 1 tsp salt and a rounded ¾ teaspoon pepper. Heat oil with 1 Tbsp butter in a wide heavy ovenproof pot over medium-high heat until foam subsides, then brown chicken in 2 batches, turning once, about 10 minutes total per batch. Transfer to a plate. Two things – Firstly, I think this is far more butter/oil than you need, particularly since you’re just going to pour it all off once you finish browning the chicken. I used it and then had to figure out how to dispose of all the discarded fat without clogging my sink. Next time I’d use a little butter or oil to start the pan and then just brown the chicken in the fat that renders as the chicken browns. Secondly, the browning part is important so don’t skimp on it. Walk away while the chicken is browning – set a timer for 5 minutes so you know when to go flip it over to the other side and walk away. Do some laundry. 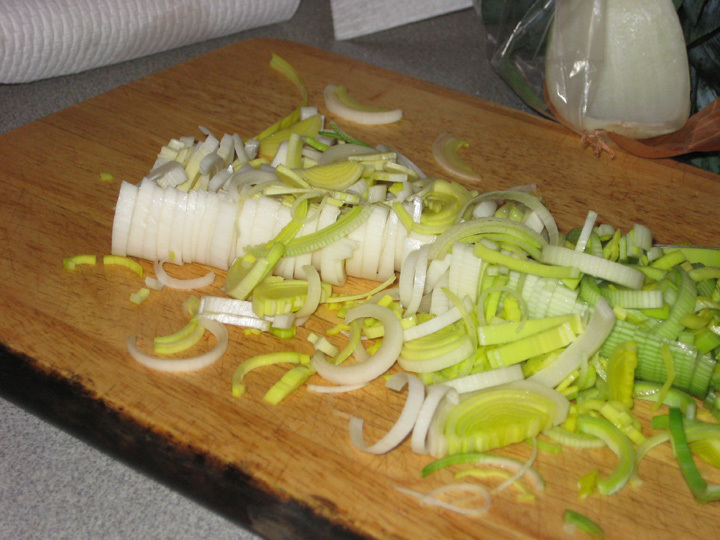 Chop your leeks. Wash some dishes. Read a book. Just don’t hover over the chicken because unless you’re an extraordinarily patient person you’ll get bored of watching it brown long before it’s really had enough to time pick up sufficient color. Pour off fat from pot, then cook leeks, shallot, and ¼ teaspoon salt in remaining 2 Tbsp butter, covered, over medium-low heat, stirring occasionally, until leeks are pale golden, 5 to 7 minutes. Add chicken, skin sides up, with any juices from plate, carrots, and wine and boil until liquid is reduced by half, 3 to 4 minutes. 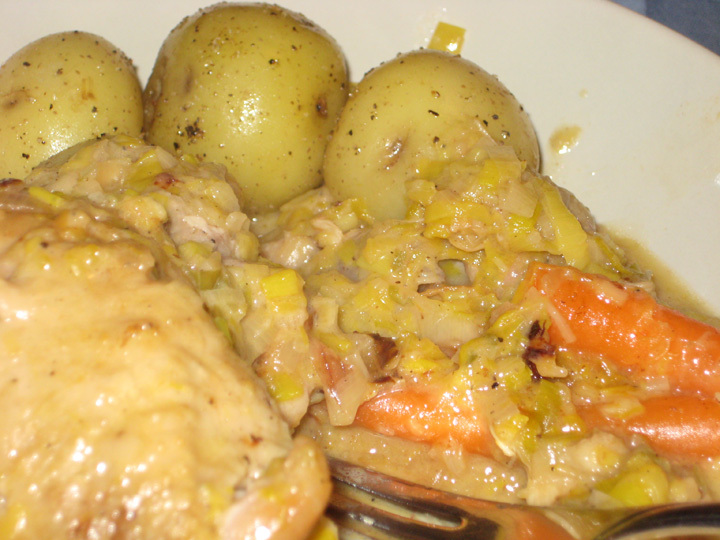 Cover pot and braise chicken in oven until cooked through, 20 to 25 minutes**. I left the carrots out when I braised the chicken on Monday night because I didn’t want them to get incredibly soggy and overcooked. I reheated the dish on Wednesday night and threw the carrots in about 15 minutes before I was planning on serving to cook them through. While chicken braises, cook the potatoes separately. 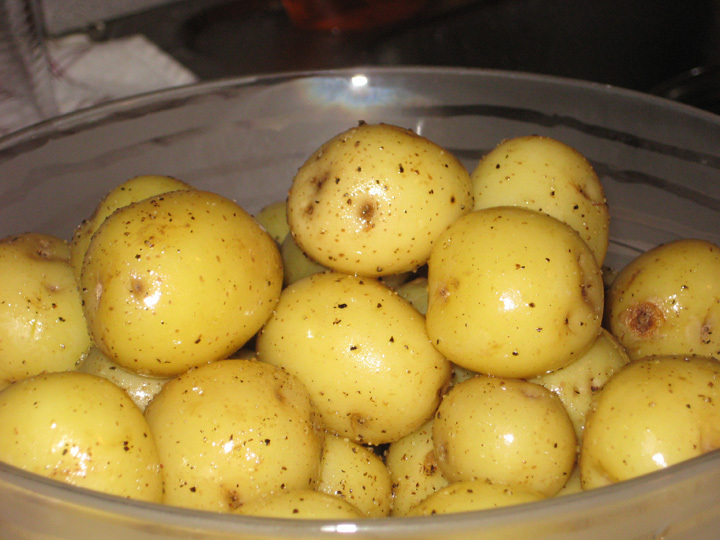 If serving separately, toss them with a little olive oil (or butter), salt and pepper. Or, you can mix them into the chicken dish just as is. Stir crème fraîche into chicken mixture and season with salt, pepper, and lemon juice, then add potatoes (or serve separately). I removed the chicken to whisk in the crème fraiche and lemon juice because my pan was too crowded to stir it in otherwise, and then I returned the chicken to the pan and brought the sauce up to a low simmer again before I served. I served in the dutch oven I cooked in, but the sauce is thick enough that you could plate the chicken on a nice platter to serve. It is a very homey meal – it doesn’t look spectacular served, although the taste more than makes up for this minor failing. Sounds extra tasty- I hope this makes a reappearance at a future Dinner! It does sound wonderful; on my menu list for next week. But, oh, for such a choice of potatoes that I could say I get those because I like them better.